This is just a memorandum of my personal instructions to cross-build linux kernel for EdgeRouter Lite (ERLite-3). I’ve been using ERLite-3 with the latest Linux kernels for three years. The user land distribution I use is Debian. It works quite well for my usage of PPPoE router at home. The important thing is to set BFD target name “mips64-unknown-linux-gnu”. Here is my kernel configuration for Linux 4.2. I hope it helps you. These kernels are for both NFS boot and USB boot. The supported file systems are ext3, ext4, fuse and nfsroot. Setup your CISCO console cable. 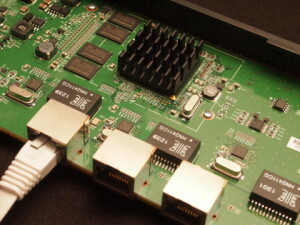 Open serial terminal such as minicom. The serial configuration is 115200bps 8N1. Don’t forget turning off HW/SW flow controls. Plug in the power cable. Then the boot loader will put messages. Prior to USB boot, you have to do following steps. If you don’t want to use USB boot, please ignore this section. Detach the USB stick from ERLite3. Mount the USB stick on your PC. You’ll see two partitions. The first one is FAT and the second one is ext3. On the first partition, replace the Linux kernel file “vmlinux.64” with new version. On the second partition, erase all existing files, then extract debian rootfs. You’ll see the debian init process in your serial console. Initially, password for root is blank. After creating users, you can remove “single” keyword from the boot command line. Prior to network boot, you have to setup tftp server, NFS server and optionally DHCP server. After confirming boot process, you can save your favorite boot command lines. You can restore boot command lines with the initial value. Even on official 2.6.32-UBNT kernel, you probably get many errors with any USB devices except the flash memory which comes from the board. I found that using USB1.1 HUB avoids this problem. I guess ERLite-3 board has electric problem to support high transfer speed. For me, some CAT5e flat cables are not capable to support 1000Mbps link with ERLite-3. This suggests ERLite-3 is electrically noisy. I’m not sure whether the device really has TT, but it works with USB devices. My ERLite-3 has now USB1.1 hub! I punched a hole on the box. Don’t worry, I have another ERLite-3. As Gentoo people says, Sandisk Cruzer Fit 16GB works for me. It costs less than $10. “mips64-unknown-linux-gnu-” cross gcc and binutils work fine to build linux kernel. If you don’t want to build the cross toolchain by yourself, you can download it from cnusers. It takes a few days to complete registration. Debian has 32-bit userland on MIPS port. Thus by defaut, “gcc” generates 32-bit code on the platform. To compile 64-bit applications, install “gcc-multilib” and “libc6-dev-mips64” packages, then call gcc with options such as “-march=mips64r2 -mabi=64“. Any comments and questions are welcome!